A Micro Game That Packs a Punch! Okay, who wouldn’t know Hiyashi Hayashi? Well, he’s not as famous as Seiji Kanai in the board gaming world, not yet. While Seiji Kanai might be the Hayao Mizayaki of Japanese designers, Hisashi Hayashi could be the shadow that was cast behind him. Hisashi Hayashi has designed several other games that are innovative and one of a kind. Some games worth mentioning are Lost Legacy, Rolling Japan, Trains, Trick of The Rails, String Savanna, String Railway, Edo Yashiki, Isaribi and many more. Most of his games are micro games, in fact only Trains is not a micro-game. Now lets look into Sail to India. 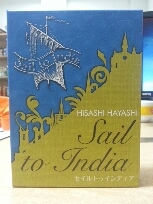 Sail to India was first published in Japan by local publisher, Okazu Brand. After that, Alderac Entertainment Group (AEG) re-published it for US / international distribution with reworked art. So what is Sail to India? 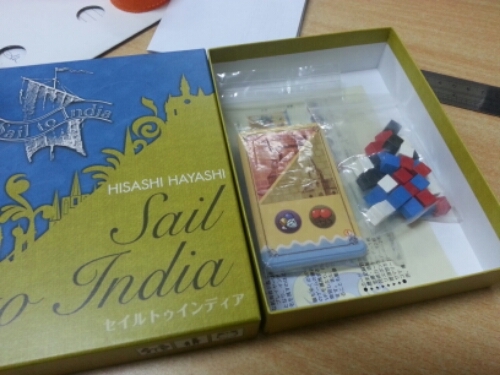 It’s a micro-game from Hiyashi Hayashi with trading and discovery theme involving some cubes and a deck of cards. The story is in the time of our ancestors about Portuguese merchants who sailed from Lisbon and reached India. And the game is all about that, really. Its really an abstract game, theme is not really the point here. In the game, players will get 2 cards, Historian and Ship cards. 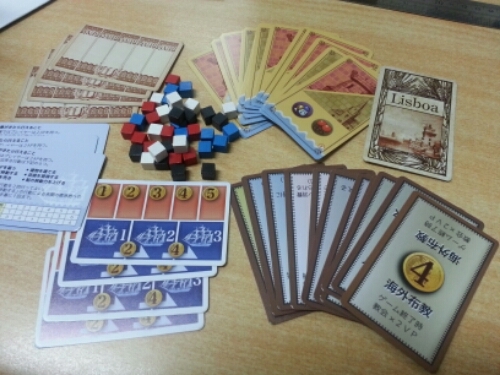 These cards are used to keep track player’s points, money and ship speed. Before the game starts, 12 coastal town cards are shuffled and placed each card face down in a single line. Flip the three first three cards face up and place Lisbon card beside the first face up coastal town card. 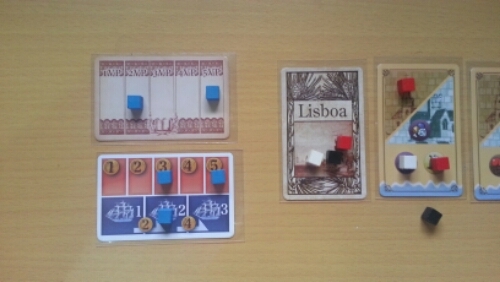 Each player takes 3 cubes of one color, places two cubes on Lisbon card, 1 cube on the first slot of ship speed. Place the rest cubes on the side as supply stock. Each player then takes a cube of his color and place it on his corresponding money track (safe) as a banker. In this game, everything has costs. Either you gain money or points, you need to add more cubes as a banker or a historian. Since the tracking is limited, you need to get more banker to fill into the track if you want to gain more, while your cubes are limited. So during the game you’ll need to decide whether you allocate more cubes as historians (you can say they store points) or maybe as bankers (they store money) in a time being. Of course you can manipulate them as you wish, one time as banker and maybe next time you change it as historian to store points. This what makes the game interesting. This action require you to pay 1 gold (adjust the money track) to get one cube from the stock / supply. This is the only way players can get additional cubes from the supply. When a player choose to move his ships, he must do the following steps. 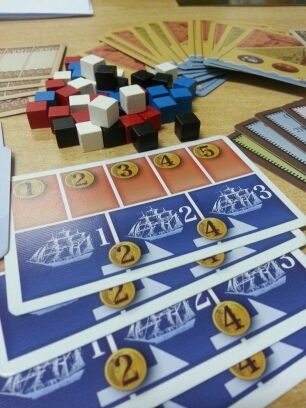 First is moving ships, ships are cubes that are placed below the coastal town cards. When moving ships, player can move them up to the maximum limit of his ship speed. He can choose to move all his ships or some of them. But keep in mind, a player can only discover a coastal town once per turn (move ship into undiscovered / face down coastal town card). 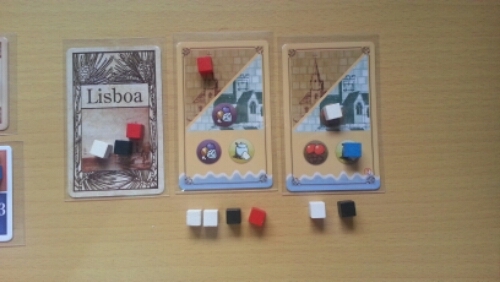 The second one is to discover a new coastal town card, which is by moving ship to a face down card. 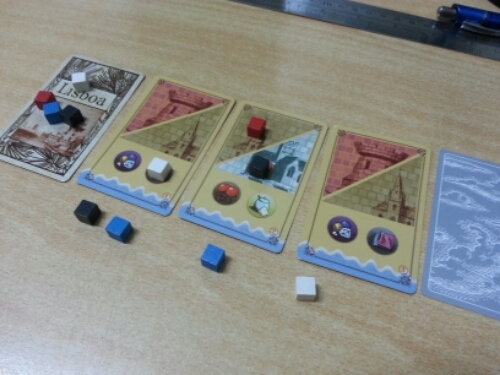 When this happened, the player flip the coastal town face up and gain 1 point. However the last coastal town card worth 2 points instead of 1, since it’s India. The last step is converting ships intl goods. Player may convert all or some of his ships into goods. It’s done by moving the ship marker to the goods area on the card (there are 2 different goods areas in one card). Each goods slot can only contains 1 cube, so this blocking other players once filled. Once your ships already converted as goods, they can no longer changed back into ships. Players can sell all of some of their goods with 1 AP. This can be done by returning one or more goods markers back to Lisbon. Players will earn money and points based on the different number of goods types they returned. If they have a goods marker on a commerce center, they may, each time they sell goods, regard it as if they sold one goods of that type. This can only happened if at least they return one goods marker as normal back to Lisbon. This actually a set collection, collecting more types of goods does give you more points and money. More of one kind is not helping you get more money and points, so players will go in diverse resources. Players can build one of the building on a coastal town card. However they need to fulfill the requirements as follow, the building is still available, have a marker on or below the card, and lastly pay 2 gold. Players can also learn a technology from the available technology cards by fulfilling the requirements as follow, the technology still available and have the corresponding amount of gold to pay. Players cannot have more than 3 technology cards, once they acquire the third technology, they cannot learn a new one. The last action that players can take is to increase their ship speed. They start with 1 speed. By paying 2 gold, they can advance 1 step to 2 speed, by paying 4 they can advance one step from 2 speed to 3 speed. Players can pay 6 gold to advance 2 steps from 1 to 3 speed but by paying 2 AP (this is the only action a player take on a single turn). So player takes turn to do actions until the game end, India discovered (the last card on the line). During the game, players will move cubes from the game to their safe (as bankers) and/or to their library (as historian). Since their cubes are limited, from time to time, players will be facing difficult choices to decide for what they want to use the leftover cubes. Their end goal are points, but they also need money to increas ship speed, buy buildings and also learn technology. At the end of the game, their buildings and technology will grant them points. The one with most points wins the game. It’s a simple game (with only cards and cubes) with easy rules yet has enough depth to keep you thinking. I like the idea that the cubes can be a lot of things and it’s back to the player himself what he wants the cubes to be. To store points or as playing marker or even store money. At first, players won’t be facing this difficult decision, but as the game progresses, they will have to decide which comes first. It’s unique mechanic of cube pusher really stands out, but not everyone like this kind of game (my girlfriend dislikes it). And the last thing, the player count range is too tight, from 3-4 players. For a small game like this, 2-player mode is a good option. Anyway, since I own the Japanese (Gamefield / Okazu brand) version, it’s notable to keep in my collection. There is also another Japanese version with small differences in components (you use another sets of cube to track down technologies. I think the replay value is not very high, since in each game the variables that makes the game different each time are the technology you buy and also the order of cards revealed. The rest is back to player’s choice to play what strategy.